Spicy Red Lentils | Time to Cook! This Moroccan-style dish is quick to assemble. Serve it as a side dish with roasted meats or fish. In larger portions, it also makes a satisfying main course. In a saucepan over high heat, combine the lentils, water, bay leaf and 1/4 teaspoon of the salt. Bring to a boil. Reduce the heat to low, cover partially and simmer until the lentils are tender but still firm, 12 to 14 minutes. Drain and discard the bay leaf. Set aside. In a small frying pan, heat the olive oil over medium heat. Add the chili and garlic and saute until softened, about 1 minute. Add the cumin, coriander and cinnamon and cook until fragrant, about 1 minute. Remove the pan from the heat. 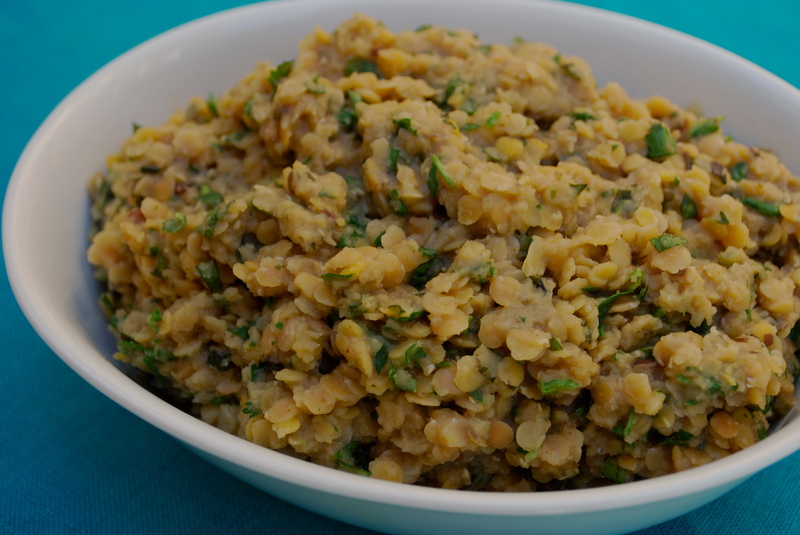 In a large bowl, combine the lentils and the spice mixture. Toss gently to mix. Stir in the parsley, cilantro and mint and season with the remaining 1/4 teaspoon salt and the pepper. Stir in the vinegar and serve immediately.